In my last two posts on this topic, I paid homage to two writers who inspired me to write Messianic Men. Here I give a shout out to the third writer I dedicated the book to: Frank Viola. Unlike Catholics Fulton Sheen and Garry Wills, Frank comes from an Evangelical/Pentecostal background. He is a prolific and courageous writer, whose best known work is a little book he wrote with researcher/pollster George Barna called Pagan Christianity. The book apparently infuriated half the evangelical world, as it deconstructed the worship service and church structure formats still in vogue in Christian churches today, showing in great detail how far it has strayed from New Testament practice and how much of it came from pagan worship practices adopted in the first century AD. This was something that struck a nerve among many in the church, including me, who look at the writings of the apostles and Jesus himself for guidance on how to have Christian fellowship. Myself, I am somewhat of a wanderer, although it isn’t so much a dissatisfaction with any church organization as much as that I just feel comfortable with any group that worships Jesus and adheres to the basic foundations of the Nicene creed. Those who do not adhere to the basic foundations laid out in the Nicene creed – your theology is divisive, separating you from the Body of Christ in essentials, and needs to be reformed). Frank is a very successful writer and offered weekend classes (Scribe) for writers, which I attended to get help on how to write and publish this book. It’s an excellent class, btw, and I highly recommend it to anyone looking for help and advice in authoring. At the 2018 Re-Scribe for returning classmates, Frank was preparing to release his latest tour de force, entitled Insurgence: Reclaiming the Gospel of the Kingdom. 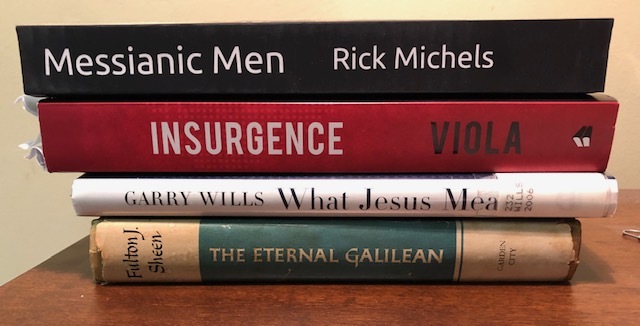 I was at the time going through my third re-write of Messianic Men (the working title at the time was Jewish Messiah), and preparing for one last go-through before self-publishing it by Christmas. Frank offered me a chance to listen to the audio version of Insurgence before the launch and, since I was preparing for a long road trip, jumped at the chance. The book made such an impression on me that I decided to do a more substantial re-write of my own, leading to a fourth re-write. Insurgence gave me a newer and sharper focus on the mission of Jesus of Nazareth that I felt was lacking. The Gospel of the Kingdom has been a well talked about yet hidden truth in Christian teaching. Certainly I had covered it in my own work to date. But in a way, my treatment followed too much of how the Christian world has been presenting it: rather mushy and ethereal. We tend to see the Kingdom of God as an alternative lifestyle (which it is), and use the term “Kingdom principles” as if it is meant to serve as a “how to succeed in Christianity and business/marriage/relationships” (which it also is). But what Frank made extremely clear in his book is that the church in the modern world is so focused on the Gospel of Jesus Christ, it is neglecting the very real presence and transforming power (If I can be permitted to use the term) of the Gospel of the Kingdom. Whereas the evangelical world tends to view the Gospel of the Kingdom as an adjunct of the Gospel of Jesus Christ, Frank pointed out that in a very significant and very real way the Gospel of Jesus Christ IS the Gospel of the Kingdom of God. Furthermore, the early church recognized it, and understood it so seriously that they were martyred for it, and overthrew the Roman Empire with it. When the early Christians were sent to the arenas to be eaten by lions for sport, it wasn’t their conscience that they died for. Nor was it even for religious freedom. The Christians were martyred because they were insurgents: political/cultural insurgents in fact, who opposed Rome. Rome was very religiously tolerant, but it demanded allegiance to Caesar. This allegiance went so far as to extend to the worship of Caesar himself as deity. To refuse to pay allegiance to Caesar’s kingdom through a simple act of worship to him was to openly defy the Empire, to be a traitor to it in fact. This wasn’t a mere act of civil disobedience: Christians were perhaps the most obedient and most solid citizens the Roman Empire had. They could be counted on to pay taxes, obey its laws, respect and obey its authorities, even help the sick and the poor. But they would not recognize Caesar as King. Jesus was King. Caesar was God’s servant, and held a subservient role as Caesar…below Jesus, who ruled the earth and whose kingdom they belonged and were subject to. This made them insurgents, counterculture revolutionaries, to the Empire and the culture that supported it. This also made them traitors and worthy of death, even death as sport. This was serious stuff. What Frank makes clear in Insurgence is that this allegiance to the Kingdom of God, to love God and His Kingdom rather than the world (Satan’s kingdom) is expected today. It also calls for an upping of one’s religious game. But Frank is very careful and clear in explaining that this is not a legalistic rule following procedure. Kingdom citizenship flows from a proper alignment of a persons’ soul with the free gift of Grace given to every Kingdom citizen, through the power of the Holy Spirit, who renounces the Kingdom of Satan and enters the Kingdom of God. What Frank did was wake me out of a slumber in which my relationship to God was to The Father. Having had a father, and having been a father, a loving relationship with a father who loves his son comes pretty easy these days. I can rely on God the Father to provide for me, care for my needs, forgive me. What He requires from me is faith in His Son. No problem there. But my allegiance and relationship to His Son and my Emperor/King, Jesus, was pretty non-existent. I liked what He did. I worshipped Him. But I kept a bit of distance from him because He would say “Follow me” and I wasn’t always sure I wanted to do that. Jesus may ask me to do things I’d rather not do. Frank’s book encouraged me to trust Jesus, to go to Him to be empowered to follow Him, and through it I felt more confidence that I could indeed, through Him, not only be able to enter into the fellowship of his sufferings, but someday, like the apostle Paul, even desire to do so. “Giving Jesus Christ His rightful place in our lives means that His character begins to take shape in us (Galatians 4:19). This is where the cost comes in, because the process is often painful. “Throughout the book of Acts, we find the ekklesia (church or assembly – Rick) growing and becoming more powerful as persecution starts and spreads. This is also the story of church history. And it’s a critical feature of the Insurgence. “The allegiance that the early Christians had to Jesus was so extreme that to receive the gospel in the first century was to be “radicalized.” Put another way, the early Christians were seen as insurgents. “They switched all their allegiances to Jesus Christ. As a result, the early Christians were viewed as outcasts who were extremely dangerous (just like terrorists are today). They were regarded as subversive to the existing empire. “Unfortunately, modern Christianity is so far removed from what it was in the first century that the association of radicalization with Jesus may be offensive to some and perplexing to others. “Jesus came to this earth as a revolutionary. He came to launch the insurgence. He came to overthrow the kingdom of darkness and set up His own kingdom in its place. “In Jesus, the time had come for God to inaugurate an indestructible kingdom that would take over all other kingdoms. The Kingdom of God is more than an alternative lifestyle. It is more than a way of life. It is more than a helpful tradition. It is an insurgence. It is hard to observe as it moves invisibly – unperceptively, and often through quiet saints doing quiet things and saying quiet prayers as they meet in groups of two of more with their King in their midst. It usually does not come “with observation” – the way a military invasion comes, as Jesus told the Pharisees. Yet the invasion is “in their midst” (as Jesus himself was). Jesus also told Peter that the gates of Hell would not prevail against the ekklesia. Thus it is not merely a flailing insurgency but a powerful invasion against Satan’s kingdom, an invasion he is powerless to stop. At his trial, Jesus was sent by Jewish leaders in subject to Rome to its emissary Pontius Pilate to be put to death as a dangerous insurgent. They argued Jesus was a traitor to Rome. Pilate agreed. Within 40 Roman emperors, would send armies to Jerusalem to destroy the Jewish kingdom, itself insurgent against Rome, and led by a false messiah who led through violence and not peace. Yet within 300 years, the line of Roman Emperors who destroyed Jerusalem would be worshipping and subjecting their Empire to Jesus, the Jewish Messiah. The transformation of the Roman empire took place without a single sword or knife thrust against it. The Kingdom of God came without observation, beginning as a mustard seed in Pilate’s hands. Yet it came, and it conquered, and still conquers.